The system requirements for SuperNova Enterprise vary for local installation on client machines and for installation on a server for use with remote desktop. Microsoft Windows 2008 R2 64bit Server. Microsoft Windows 2012 R2 64bit Server. Older versions may also work. CPU Usage: Maximum of 4 Dolphin Software users per CPU-core (approx 700Mhz per user), ideally 1 Dolphin Software user per CPU-core. Memory: 250MB per user – the memory requirements of third party applications that are used should also be taken into account. GPU: physical GPU not required. Virtual emulated GPU required. 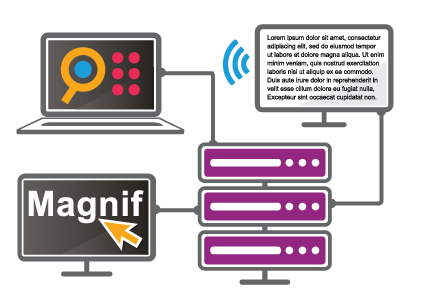 Magnification can be configured to run on a virtualised real GPU, or on the CPU. For remote SAM extensions, a spare RDP/ICA channel will be required. Our 30 day trial includes a MSI installation for SuperNova Magnifier & Screen Reader only, however upon purchase will be extended to all 3 editions of SuperNova and ScreenReader.